for your free in-home consultation. Custom shutters express your sense of style with timeless appeal and classic beauty. Complete your home décor with the perfect statement piece, made just for you. Stanfield Shutter Company is Utah’s premier interior shutter manufacturer serving Utah for over 70 years. Stanfield Shutter, Utah’s first interior shutter company, has grown to specialize in all types of shutters from traditional to plantation shutters. 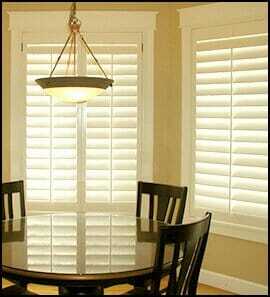 With all of our shutters we use the most advanced and proven methods to mill, assemble, finish, and install shutters. This includes all ours shutters including custom shapes for arches, angles, circles, ovals, octagons, and square/rectangle shaped windows. Each of these include a limited lifetime warranty. These economical shutters are warp free, have smooth painting surfaces, and retain the same strength and resistance of natural hardwood! Basswood has small or no knots, and because of that pattern Basswood lends itself more to a classical or a traditional decorating style. Knotty Alder is currently the most popular stained natural hardwood, it matches the décor of a lot of new homes that are using stained applications. Our high grade vinyl synthetic shutters are waterproof, this is best for over a kitchen sink or in a shower stall and can withstand water without damage. We’re committed to the design, manufacture, and installation of quality shutters that exceed our clients’ highest expectations. We’ve spent over 60 years perfecting the art of creating beautiful custom shutters, and it shows. See what our clients have to say! We’ve had an amazing experience with Stanfield Shutter. Their service is first rate and they really go out of their way to make sure everything is adjusted and fits perfectly. We had a rather awkward location of a sliding door shutter and it looks and functions amazingly. We wouldn’t ever consider anyone else. My experience with Stansfield Shutters was great! They were prompt in coming to measure, getting my quote to me, and the install was so fast. The quality is excellent and they look beautiful!! Very good experience with Stanfield Shutter,very good product and good price. Shutter looks amazing after installation,thanks to 2 guys they are very professional and I will recommend to all my friends this company. Very important guy who take all mesurment he did such a great job, all shutters fits perfectly. Thanks Ms.Gary for very good product and I wish you best in your business. You are guys the best.